Marinated in a quick homemade sweet-and-sour sauce, this tender beef sirloin tip roast is oh so delicious. And the delicious fresh vegetable topping adds the perfect finishing touch. Reserve 1 tsp. lime juice for later use. Mix remaining lime juice with lime zest, pineapple, ketchup and pepper until blended. Pour over roast in large bowl; turn to evenly coat all sides of roast. Refrigerate 6 hours to marinate, turning roast occasionally. Heat oven to 325ºF. Remove roast from marinade; discard marinade. Place roast in shallow pan sprayed with cooking spray; cover. Bake 3 hours or until 150ºF, uncovering after 1 hour and basting occasionally with pan juices. Remove roast from oven. Let stand, covered, 15 to 20 min. or until medium doneness (160ºF). Meanwhile, combine remaining lime juice with remaining ingredients. Slice meat. Serve topped with vegetable mixture. 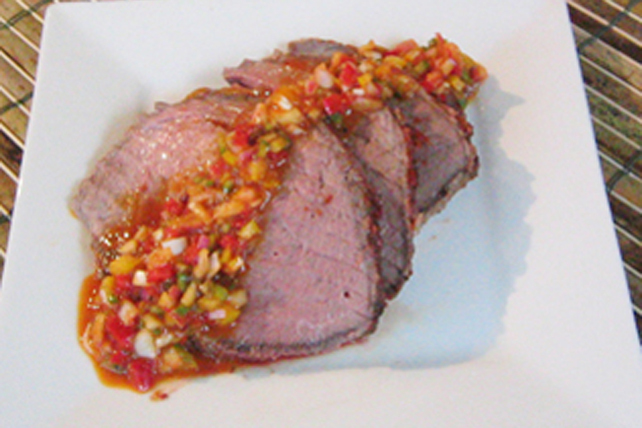 The roast can be marinated up to 24 hours before baking as directed. Serve with hot mashed potatoes and your favourite cooked seasonal fresh vegetable.